FLEX avoids the dilemma of people needing to start with a solution while recognizing that no one-size-fits-all by taking a step-wise approach to Lean-Agile transformation. At any point in time, FLEX provides a well-defined, well-documented set of steps that have been tailored for the company undergoing the transformation. We don’t need to create a complete set of solutions or road map, just the first steps that are clearly the place to start. See FLEX’s Philosophy of Transformation for more. FLEX applies Lean and Agile thinking to the goal of business agility: The quick realization of business value predictably, sustainably, and with high quality. A side benefit of doing this properly is that one has the ability to continuously change direction as needed when new information both inside and outside of the company is attained. FLEX focuses on identifying the things a business wants to invest in. Examples include “improve the customer experience,” “retain assets,” and “improve our internal environment.” All of these are based on the vision of the company but not all of them are customer facing. Another way to think of the list of business value is “what are we willing to invest in?” This might include helping improve our people. Understanding what value the organization is committed to manifest. Identifying the set of strategic initiatives that reflect that commitment. Aligning across the organization (video or article) that this is what the company is committed to achieving. Generating the smallest chunks of work that can be realized (typically focused on target markets). We call these Minimum Business Increments (MBIs). Sequencing these MBIs into a list from which to pull. Allocating proper capacity to realize value from the MBIs in the quickest way possible. 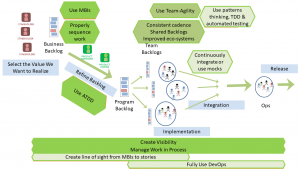 Managing Work-in-Process (WIP) at all levels (from MBIs to features) across the organization. Having management lead the change by creating a great environment within which people can get the job done. Continuously learn by making your workflow explicit and removing impediments to it. Periodically re-evaluate your entire process to ensure you are looking at the big picture. Agree to do the above via agreements of behavior. There is no one set way to start. Figure 1 illustrates a way to start. It is just a guide. The bright green items (such as Use MBIs) are typically the most helpful ones to start with. The lightest ones are typically the last things to implement. You must look and see how each of these interacts with the other because systems thinking (and experience) tells us we are in a system where each change affects other actions. Figure 1. Example of a way to start. Although there is no “right way” to implement the aforementioned solutions, they generally go in the order of the diagram below (from left to right). Although there is not a set roadmap of adoption, there is a definite pattern of adoption. Variations may occur in order, but mostly they occur to the degree to which the steps are adopted. A common adage when starting a transformation is to take the low-hanging fruit. That is, those actions that are easy to take and that return a quick investment. However, taking low hanging-fruit does not account for its effect on later changes. Sometimes starting with the wrong thing may be easy but may make later changes more difficult. For example, starting with Scrum may achieve better Scrum teams but 1) doesn’t necessarily help the bigger picture problems and 2) may make it that teams don’t want to slow down later when they need to in order to work with other teams. That is, teaching local optimization as a start can make it harder to achieve value stream optimization. Taking steps at the front of the value stream such as using Minimum Business Increments (MBIs) has a positive effect on the rest of the value stream. These costs and benefits vary from organization to organization so an exact order for all organizations does not exist. However, patterns from working with scores of companies and talking to hundreds of others suggest using a pattern of phases starting as close to the initiation of the work as possible. In general, it is good to start with these practices. Create Visibility. This means to have all work be visible as well as the steps the work goes through. This visibility should extend throughout the value stream so those downstream can see what is heading their way and that those upstream can see the workload of those they will need to finish their work. Creating visibility is typically easy enough to do all at once. Use Minimum Business Increments. MBIs are effective at lowering the amount of work to be done. This benefits the entire value stream. While MBIs should be defined by the business stakeholders, in some organizations this is difficult to start with. In these cases the technology group should take what is given to them and form their own. Manage WIP. While managing Work in Process is equally important to using MBIs, managing WIP is much easier to do when MBI are being used. This is because business stakeholders now need to wait for smaller pieces to be done and are more likely willing to do so. Get business analysts, product owners, customers developers and testers talking at the same time. For more information, see How to start with Acceptance Test-Driven Development. Consistent Cadence Across Teams. Merely having all teams on the same cadence, say every two weeks and starting their iterations on the same day, will enable them to improve their collaboration with little additional changes. The reason FLEX can work is that the end game is typically the same for different companies of the same approximate size. Variations in regulation and outside constraints do make a difference and FLEX will be expanded to include those in the near future. If you’d like more information on what the steps to achieve are take a look at Using the FLEX Mindset and Experience to Determine What We Have to Do.